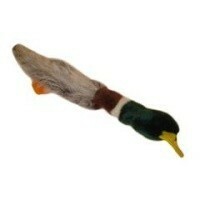 Happy Pet Empty Nester Mallard is a high quality plush toy that your pet will love to play with. This toy is perfect for playing multiple games and features hidden squeakers to send your pet into a mad frenzy for hours. Being only just a plush material outer, this toy is safer and much more durable than other polyester wadding filled toys, making it number one choice for pet owners who have particularly destructive dogs. A fabulous toy that will ignite the playful spirit of you dog!